You can get a free copy of your birth chart now by using our Chart Services. Go to our Astrology Report order page and choose the free Chart Wheel at the very bottom of the list by clicking the white "Click here for Wheel" button. Then fill in your birth information, and you’ll receive your chart by e-mail. Notice the red arrows on this sample chart. 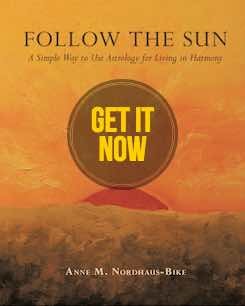 One points to the symbol for the Sun, which looks like a circle with a dot in it. 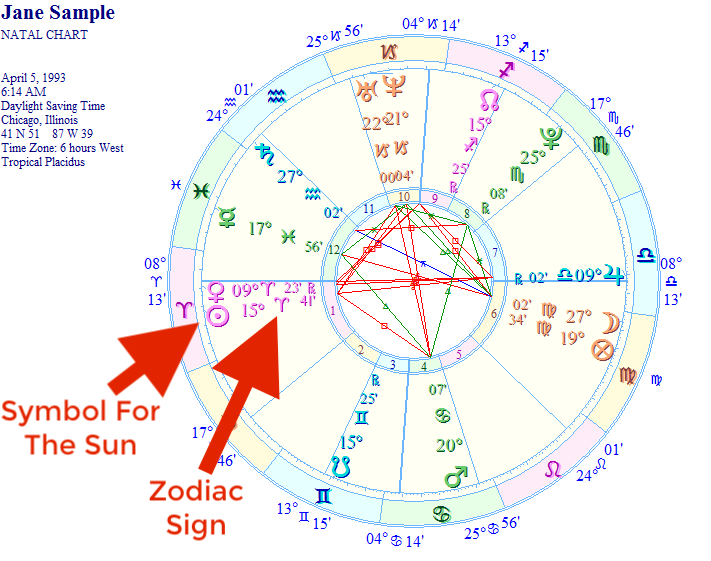 the other arrow points to the zodiac sign the Sun occupies. Did you know that an astrology horoscope report will tell you your zodiac sign—and the signs for all the other planets in your chart? A report is a great way to take your astrology to the next level. If you’re wondering how to choose which astrology horoscope report is best for you, we have you covered. See the article on How To Choose An Astrology Report to know exactly what you need! 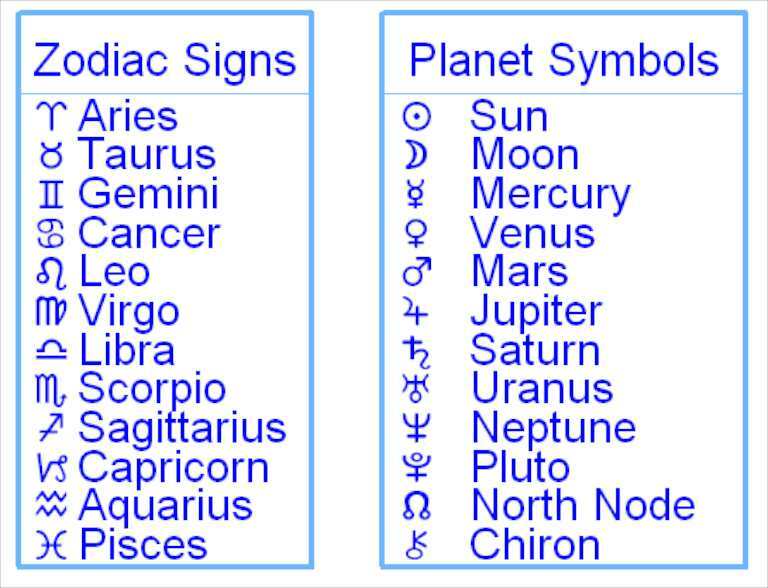 If you want to figure out your zodiac sign for yourself, then you can use the Zodiac Signs and Planet Symbols tables below. Have fun with your free birth chart! And enjoy your astrology! Jeanie, watch for changes later this month after planets start to move into Pisces. And be sure to read your monthly horoscope this month…and next month. Developments coming in the months ahead! Hi Jaenne,i was born in 1970..am Virgo.I have the same problem.Can we come together? Am realy happy to meet you here.I was born on the 1st of September 1970.My love life has never be good at all.I have been loosing partners the time i need them most and the second problem is job and money.Almost 4years now i have been having troubles of geting job and loosing my properties too.Am in Kenya. When will i get Money this year? When will i get a serious partner for long term (my compatibility). Keep reading your horoscope each month to find out about job, romance, and other topics. Energies coming in the months ahead to help! I was born on 22nd September 2000.. I don’t know the time but its somewhere around 12.25 PM.. I want to know which type of career will suit me the most? I want to go in animation and designing. Will it be good for me? Thank you for visiting the site and getting in touch. Do get your chart for the time you do have–the Sun changed signs that day, so you are either Virgo or Libra. Either one of those signs can be good for that career. Keep reading your monthly horoscope every month for more details: https://astrologeranne.com/free-monthly-horoscopes/ There are many planetary changes coming that can help you, many new opportunities you will want to be aware of. Good luck to you! Thank you for writing. Born 18 April, you are an Aries. Thanks again for getting in touch, and good luck! I wish you the best in life, always. Hey I was born on 1997/01/15 when I will get job? Nd will I get back my loved one again now we are not together I still love him is he will back to me???? Hello, Karolina. If you need a reading for November, try one of our Starlight Solutions Report forecast reports, either the 3 months forecast or a full year of forecast highlights: https://astrologeranne.com/190/plan-your-life-with-astrology-starlight-solutions-forecast-report/ Or try a birthday report with the Many Happy Returns Solar Return Report: https://astrologeranne.com/192/birthday-astrology-report-solar-return/ A report is a great doorway into deeper astrology about yourself! Thanks for getting in touch! Have a wonderful day!